Monaco F1 Grand Prix is held over four days, with practice day on the Thursday, qualifying on the Saturday, and the main race day on the Sunday. The race starts at 2pm (with the first warm up lap at 1.30pm) and runs for 78 laps on a legendary circuit that includes such landmarks as Tabac Corner, the Swimming Pool, Casino Square, the famous tunnel, Beau Rivage, Mirabeau, the Fairmont Hairpin and Rascasse. As well as the motor racing, the off-track atmosphere is electric with lively bars, superyacht parties, luxury fashion shows and charity soirées. luxury yacht. People can charter their own private yacht either in port or at anchor, however for those without the required budget, there are shared hospitality on a yacht packages which are a good option. GP Management are Monaco Grand Prix specialists who can offer tickets for Saturday and Sunday on luxury yachts; costs from €1,500 per person. 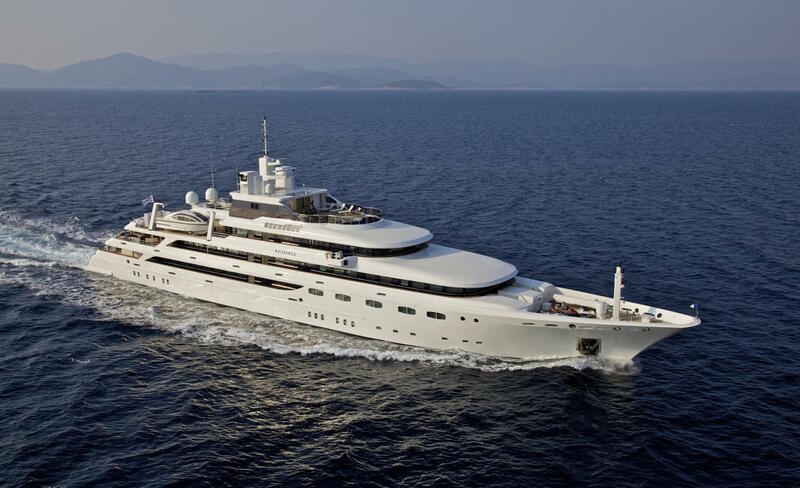 The most sought-after yacht charters during Monaco Grand Prix are on yachts and superyachts in Port Hercule with prime trackside berths; full GP hospitality packages are offered on yachts from 25m-60m sleeping 6-32 guests and entertaining 10-300 guests. Cheaper options include berths outside Stars ‘n’ Bars, or at Port Fontvieille and in the Port of Cap d’Ail. Day charter options feature some fantastic yachts – to guests staying at anchor or without a view of the circuit, tenders can come and go with permission from the Harbourmaster and Bespoke Yacht Charter and GP Management can arrange viewing packages on luxury yachts or private terraces. 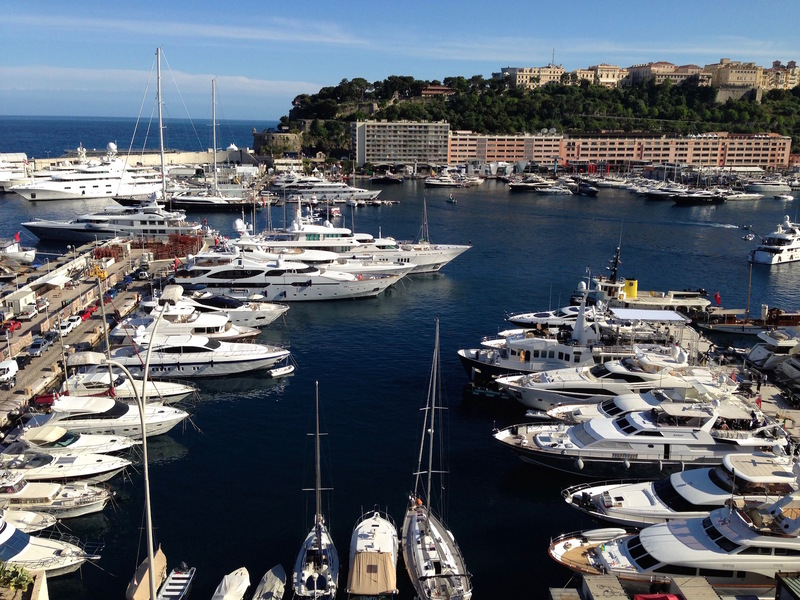 It’s vital to discuss options with an expert yacht charter broker who can advise you on a yacht to suit your needs whether you plan to enjoy the Monaco Grand Prix with friends, family or corporate guests. Not all charter yachts are available for event charters so plan in advance to get your preference booked in! O’MEGA sleeping 30 and able to host large parties for 200+ people has a Jacuzzi on the Main Deck, lots of seating areas and a good selection of water toys to keep guests entertained. 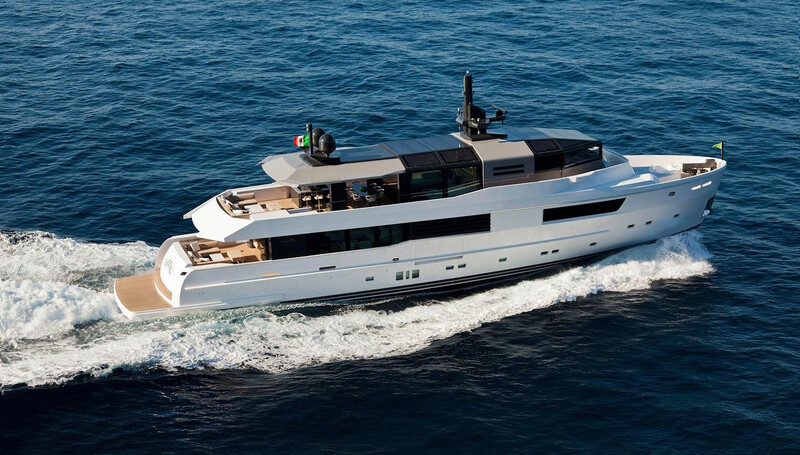 Equipped with two Fassmer enclosed life boat/limousine tenders with air conditioning, audio equipment and leather upholstery for 22 guests, O’MEGA will ensure you have plenty of reasons to get guests on board. €525,000 for the week plus taxes and all expenses. M’OCEAN sleeping 10 and hosting parties/race viewing for up to 60 people in port is a contemporary and stylish choice with a Jacuzzi on the Main Deck and excellent spaces on the Main Deck and Aft Deck for entertaining and sunbathing. €16,300 per day plus all. sport yacht with superb multi-functional areas for lounging or dining; €7,500 per day plus all. 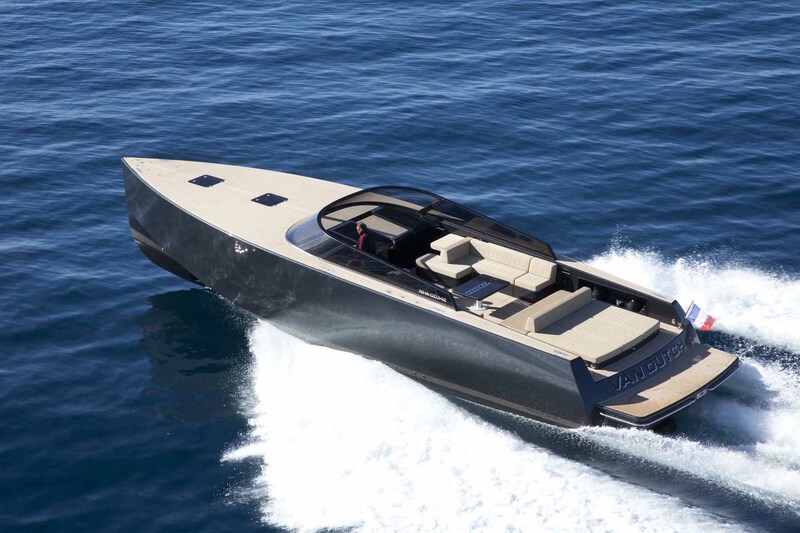 Day charter options costing from €2,000 per day include sleek yachts such as the VanDutch 40 and similar models. Monaco doesn’t have an airport, however it has excellent proximity to Nice Côte d’Azur Airport and good transport links. Helicopter transfers are very popular during the Monaco Grand Prix and must be booked well in advance with Heli Air Monaco. A single flight from Nice to Monaco costs from €175 and this includes an onward driver to anywhere in Monaco, if accessible by road (Note: Sunday Grand Prix main race day, access roads are closed to traffic and Heli Air Monaco can’t ensure liaison with shuttles). The best option is to walk from Monaco Heliport on arrival to nearby Port Fontvieille and take a tender straight to your yacht! 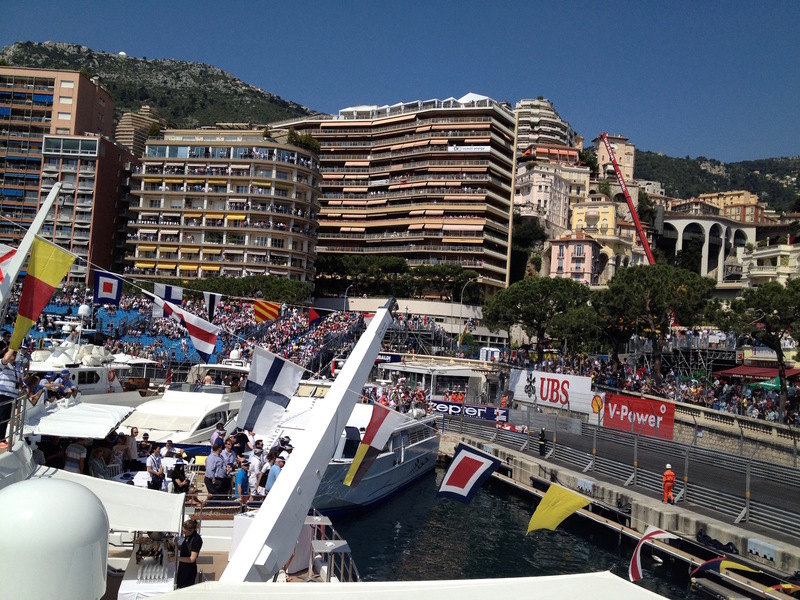 Monaco F1 Grand Prix is a pinnacle event for the superyacht crowd and it should be noted that it’s necessary to plan well ahead – about six months in advance – as there is a strict application process to be followed to get a yacht into Port Hercules for the event. Due to its locality, Monaco is a superb base for extended yacht charters so you can incorporate a Grand Prix experience with cruising to St Tropez, the Italian Riviera or elsewhere in the Mediterranean. For more information about ‘Luxury Yacht Charters for the Monaco F1 Grand Prix’ please contact your preferred yacht charter broker. Article courtesy of Rebecca Whitlocke on behalf of Bespoke Yacht Charter.